Optimized for musical instruments, dressing guitars with a protective barrier that provides superior resistance to grime and moisture. 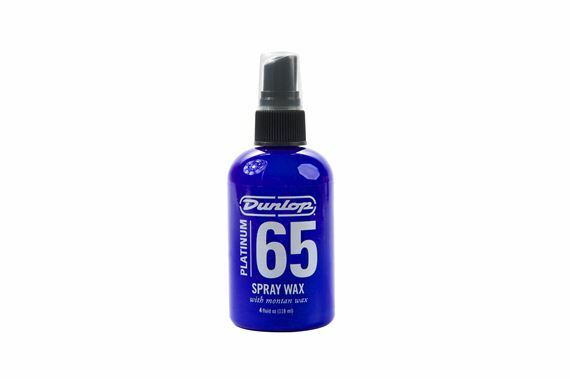 The proprietary Platinum 65 formula is optimized for musical instruments, dressing guitars with a protective barrier that provides superior resistance to grime and moisture. Platinum 65 products take less time and less effort than any other wax-based care products - there's no need to wait for drying, and there's no need to wear your arm out trying to even out the surface coating. Just apply to the surface of your instrument, use a clean cloth to gently buff it out, and you're done. Platinum 65 care comes in three forms. For quick and easy everyday care, there's the 1-step Cleaner-Polish - just spray and buff. For weekly use, or whenever more thorough care is necessary, use Deep Clean and Spray Wax. Deep Clean removes dirt and grime, while Spray Wax provides a protective barrier and a long lasting shine in a fraction of the time required by other waxes. Both Deep Clean and Spray Wax are silicone-free. 4 oz.